A typical 15-bed hospital unit experiences 942 high-priority monitoring alarms each day.1 That’s almost 63 alarms per bed each day, or 40 alarms that nurses are required to tend to each hour. With such a high volume of alarms sounding off regularly, it can be easy for staff to lose a crisis alarm in the mix of continuous beeping. Alarm fatigue is serious. 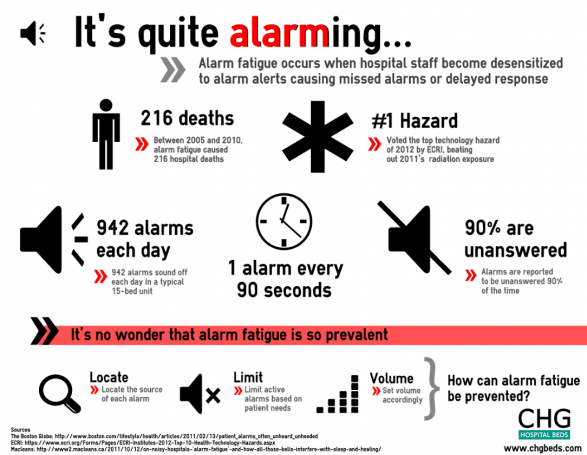 This entry was posted in Alarm, Infographic, Nursing Education, Patient Satisfaction, Patients and tagged Alarm, Infographic, Nursing Eduation, Patient Satisfaction. Bookmark the permalink.